For Day 4 of our Stampendous Blog Hop and Giveaway, both design teams are excited to share fabulous inspiration and tips using both companies’ products. Keep scrolling to see what they have done! Enter to win giveaways so stay with us until the end for details. Hello, paper crafters, Tracy here sharing my super cute little Christmas Elf card created using Scrapbook Adhesive by 3L® and Stampendous stamps, dies, and glitter. 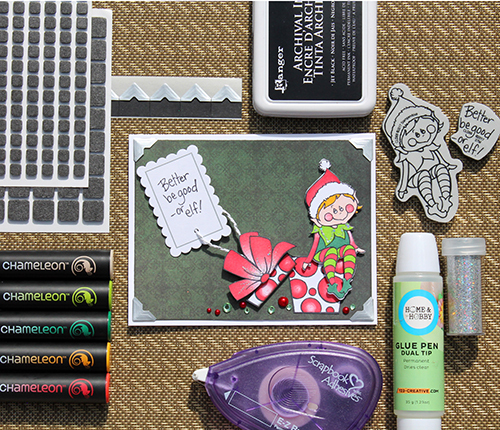 To start, I stamped and die-cut this super cute elf and gift designs from the Seated Elf Cling Stamps and Dies Set. I coloured the die cuts with Chameleon Pens. With the Dual Tip Glue Pen, I added glitter from the Frantage Encrusted Jewel Kit for detailing on gift box bow and the elf. Finishing touches include lots of dimension using 3D Foam Squares and another hint of silver with the Creative Photo Corners in silver. 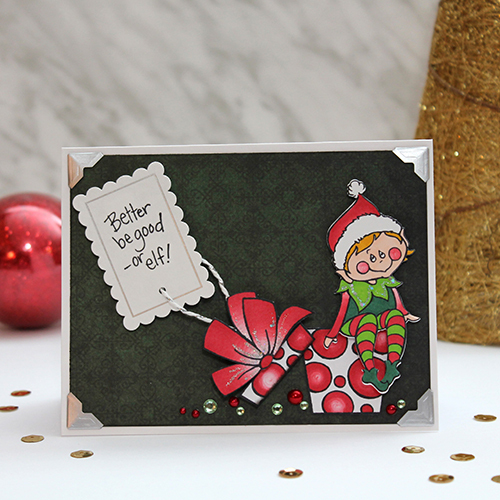 For the full tutorial, visit my blog by clicking: Christmas Elf Card Tutorial. Today I have the pleasure of using the Wrapped Poinsettia cling stamp and die set and the Encrusted Jewel White Kit, along with a little bit of gold EP too. And always, Black Creative Photo Corners and 3D Foam Squares for my adhesives. These stamps and dies are designed to be layered. First I stamped and embossed onto watercolor paper, then colored with watercolor pencils. I brushed in a little bit of water to soften the shades, allowed it all to dry, then die cut. Wowsers! What a fun and sparkly background technique! Finish by bending and ‘fluffing’ the pieces of the poinsettia, and adding 3D Foam Squares between the layers to create dimension. I stamped Merry Christmas at the top for a unifying black element. Due to the nature of watercolor paper, I used Premium Double-Sided Tape 1″ to adhere the paper to the light green cardstock. Day 5, click: Stampendous Blog Hop and Giveaway – Day 5! Day 3, click: Stampendous Blog Hop and Giveaway – Day 3! Day 2, click: Stampendous Blog Hop and Giveaway – Day 2! Day 1, click: Stampendous Blog Hop and Giveaway – Day 1! Stampendous Blog Hop and Giveaway – Day 4! Winners are randomly chosen. U.S. entries only. If you cannot see the comment section (at the bottom of this post), please click: Stampendous Blog Hop and Giveaway – Day 4 and scroll down to the bottom of the post. This entry was posted in 3D Foam Squares, Adhesives, Announcement, Cards, Crafts & Tutorials, Creative Photo Corners, E-Z Runner® Grand, HomeHobby by 3L, Other Adhesives, Seasonal Craft Ideas, Winter and tagged 3D Foam Squares Mix Black, 3D Foam Squares Mix White, 3D Foam Squares Regular Black, 3D Foam Squares Small Black, Beth Pingry, Card, Card Making, Christmas, Creative Photo Corners Black, Creative Photo Corners Mix Pack, Creative Photo Corners Silver, Dual Tip Glue Pen, E-Z Runner Grand Dispenser, Holiday, HomeHobby by 3L, poinsettia, Premium Double-Sided Tape 1", Stampendous, Tracy McLennon. Bookmark the permalink. 21 Responses to "Stampendous Blog Hop and Giveaway – Day 4"
I love that poinsettia card! Sheer elegance! Cute elf card and I like the dimension on the beautiful poinsettia card. ADORABLE cards, so cute. Love your products also especially your foam dots I use them on my cards all the time. Thanks. Such an adorable elf card! 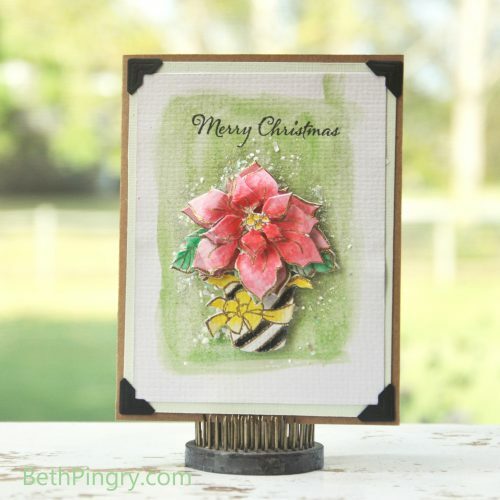 I am totally loving the pretty poinsettia card by Beth! Poinsettias are my favorite flower and this is a beauty! TFS! Oh my goodness, these are gorgeous!! Love that adorable elf and especially the card’s sentiment!! Sweet! And the Poinsettia is off the charts GORGEOUS!!! lOVE the beautiful chunky glistening background! Great technique and inspiration!! the little elf is adorable. Love the play on words. Wonderful cards!! I definitely need to get out my Frantage kits and play with them. Love the awesome effects on these cards. Awesome cards! Love the photo corners! The elf is adorable, and the poinsettia is lovely! Pretty colors and dimension! Wow! What a great background! Really cute card. Love the cards today. The elf is adorable and the poinsettia is beautiful. Wonderful designs and coloring. OMG!! That elf is so adorable. Love both of the cards Thanks for the great directions and inspiration. I’m smitten with Beth’s card. Promise it’s not because we share a name. The coloring,layering and background really appealed to me. I have to try embossing first, coloring second=great tip. Oh my goodness. That Elf card with the fun polka dot package is so adorable and such beautiful coloring work, it’s so perfect. 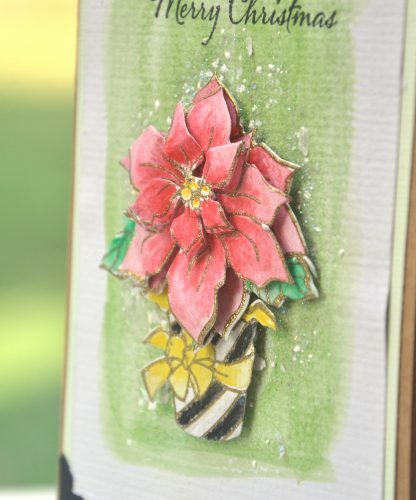 And that poinsettia in a pot with the beautiful watercolor background is the perfect Christmas Card. What great projects by the designers. Those stamps/dies have to go on my wishlist now that I’ve seen how fun they are. Very cute elf on the self card and a very beautiful rose card!!! Awesome cards! The dual tip pen looks interesting, would love to try it. Also love how you used the encrusted jewel technique. 🙂 Thanks for sharing. Eeeek – the dual tipped glue pen and the cute stamp and dies are both new to me!!! Love love love!!! Both cards are awesome! love glitter for the holidays!